FINRA compliant hypothetical illustrations of different pricing and tax structures. ILI Administration - Institutional Life Insurance (ILI) funded programs for highly compensated employees and trustees to fund invest outside a tax-qualified plan. 1986 - 2001 - Design, funding, implementation and administration of non-qualified deferred compensation plans - supplemental employer sponsored programs for executives capped-out of pension, profit-sharing and 401(k) plans. Plans informally funded with employer-owned ILI (COLI / BOLI). 1993-2000 - TOLI (Trust Owned Life Insurance) analysis and administration for trustees of Irrevocable Life Insurance Trusts (ILIT). From - A death benefit protection policy with enhanced tax-deferred cash value investment features. Into - A tax-deferred fund investment container with added financial protection. 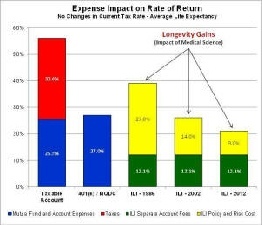 Highly Compensated Individuals - ILI has evolved into a more suitable alternative for fund investing outside a tax-qualified plan - An unlimited Roth alternative - No need to risk your paycheck in an unsecured non-qualified deferred compensation plan (409A). Trustees - Access to ILI (1) addresses structural suitability problems of retail replacement priced life insurance in ILIT’s and (2) the funding of “funded” trusts that do not own life insurance. ILI has been the preferred alternative investment of corporations (COLI) and banks (BOLI) for over thirty years. Because ILI risk rates costs less than today’s tax rates. VVC and its ILI support services were created in 2002 to bring ILI access to the individuals whose career and life choices make the ILI value proposition … possible. Consumer Disclosure Analytics - Specialty investment and life insurance analytics disclosing the prospective values of different pricing and tax using the consumers market and tax planning assumptions. The STAR Plan - VVC is the ILI plan sponsor and administrator facilitating individual and trustee direct access to leading ILI products and ILI investment management. Retail - Serving the general population with death benefit oriented product that can be managed for high cash values - the LIRP (Life Insurance Retirement Plan). Institutional - Registered and Private Placement products designed for use as alternative investments serving corporate American and Highly Compensated / High Net Worth markets. Firms must choose which marketplace they serve. VVC serves the individually-owned and trust-owned segment of the Institutional products marketplace. VVC’s story is one of commitment to the idea that successful individuals should be able to save as simply and efficiently as anyone else - Personal Parity Restoration. Medical science and the HCE (Highly Compensated Employee) risk profile made this possible. This is why all we do at VVC is support successful individuals across the U.S. with direct access to ILI - because comparative analysis demonstrate no other pricing and tax structure achieves the lifelong Personal Parity Restoration objective as effectively. A different value proposition for the individuals whose career and life choices make ILI … possible. VVC serves ILI qualifying individuals and trustees with (1) Consumer Disclosure Analytics and (2) ILI Access and Investment Administration.